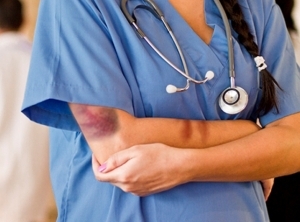 Occupational violence and aggression is rife within the healthcare sector. The impact of verbal and physical assault can leave psychological scars that lead many to question their place in the workforce. Growing public awareness, harsher penalties for perpetrators, and improved safety strategies mark a shift towards a culture of zero tolerance and collective attitude that enough is enough. Robert Fedele investigates. Registered Nurse Lita Olsson was 30 weeks pregnant when an intoxicated and disoriented middle-aged man struck her to the chest as she was carrying out routine nursing care. Lita has been a nurse for 11 years and worked in ED since 2007. She says workplace violence and aggression in hospitals is widespread. The Royal Brisbane and Women’s Hospital has made significant inroads over the past few years by empowering nurses to report assaults to police and Lita believes that changing culture has helped build the capacity to capture more accurate data. Progression towards a zero tolerance approach was initially sparked by several incidents within the department where staff were subjected to ongoing threats over consecutive days and were later to complete their shifts due to feeling scared and victimised. “From that, we really took a stand as a department and banded together to try and change the culture that if it’s not a life-threatening issue then it’s not acceptable and they won’t be treated,” Lita said. The Queensland government has jumped on board the push and earlier this year launched a $1.35 million public awareness campaign to stop violence against hospital staff and paramedics. Figures show that last year, more than 3,300 healthcare workers were physically assaulted across the Queensland workforce. More than 300 incidents have already been recorded in Royal Brisbane and Women’s Hospital’s ED this year, a statistic Lita labels “just the tip of the iceberg”. The public campaign features confronting advertisements of healthcare workers being verbally and physically assaulted while on the job. A recent strategy implemented by the Royal Brisbane and Women’s Hospital in a bid to capture data that exposes the problematic issue has been a swipe card reader mounted to a wall in the middle of the ED. When an assault occurs the card is swiped in real time and the information is later used to pinpoint peak periods and help shape future strategies. Lita is Acting Clinical Nurse Consultant within Royal Brisbane and Women’s Hospital ED. She is also the department’s central liaison and sits on Royal Brisbane and Women’s Hospital Aggression Taskforce, a committee formed to address issues, mitigate risks, and altogether keep nurses, doctors and patients safe within the hospital. The 32-year-old mother of two was compelled to become an advocate on the issue after returning from maternity leave and uncovering the escalation in alcohol and drug-fuelled violence pervading in the ED. In Tasmania, Registered Nurse Deanna Butler holds the role of Clinical Coordinator and Navigator within the Royal Hobart Hospital’s ED. Deanna recalls another incident where a patient affected by Ice became violent and aggressive and smashed up an X-Ray machine before the police were called. While the Ice epidemic poses a major issue across Australia, Deanna argues alcohol is the biggest cause of workplace violence in hospitals. Recent finding from a large-scale study investigating eight emergency departments across Australia and New Zealand in 2014 conducted by the Australasian College for Emergency Medicine (ACEM) revealed that at peak times, one in eight presentations was cause by alcohol. The study found verbal aggression from a patient has been experienced in the past year by 97.9% of survey respondents, and physical aggression by 92.2%. A significant 87% said they felt unsafe in the presence of alcohol-affected patients and 42% had often of frequently experienced physical aggression from alcohol-affected patients. Women were more likely to experience frequent verbal and physical aggression from alcohol-related patients at 69.1%. The hidden toll of violence and aggression caused by alcohol-fuelled patients contributes to a negative impact on staff workload, wellbeing and job satisfaction, the study found. At Royal Hobart the ED is always staffed with security and Code Black teams are on hand to respond to escalating incidents involving threats to staff with weapons. Professor Gordian Fulde is the Director of Emergency at St Vincent’s Hospital in Sydney, arguably one of Australia’s busiest EDs. A longstanding advocate against the scourge of Ice and alcohol fuelled violence that triggers a flood of people into Australian hospitals each weekend, Professor Fulde was named the Senior Australian of the Year for 2016 largely due to his tiresome work to solve the issue. Indeed, times have changed, with lengthy jail terms of up to 14 years now in place across several states for people who commit violence against health professionals. Framing the debate, Professor Fulde says the equation is simple: nobody should have to go to work and feel threatened. Asked to consider the impact of the drug Ice, Professor Fulde says it’s influence is wide-ranging and effects unpredictable. Professor Fulde disputes some areas of research, largely survey-based, that indicate a drop in Ice use. 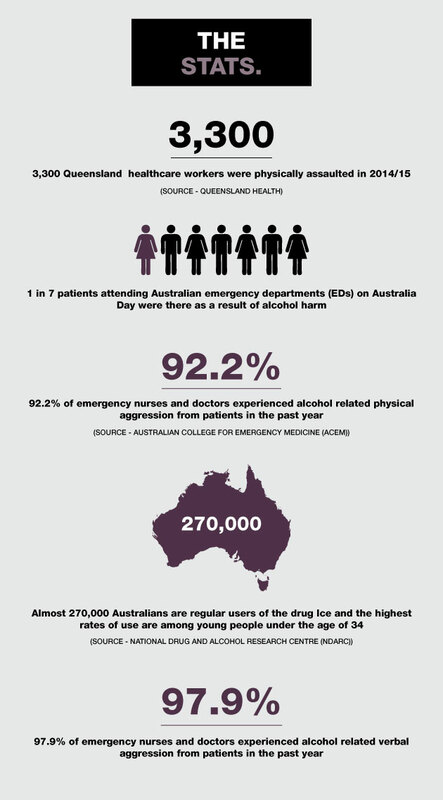 The latest statistics from the National Drug and Alcohol Research Centre (NDARC) support his claims and show almost 270,000 Australians are regular users of Ice, with one in 100 addicted to the harmful drug, and that use has increased in the past five years and remains highest among young people under the age of 34. Professor Fulde says the bulk of Ice-affected patients rolling through doors present with paranoia and agitation rather than being completely wild and berserk as some may believe. Positively, violence and aggression towards health professionals is being tackled in significant ways across the country. In 2014, the Australian Nursing and Midwifery Federation (ANMF Victorian Branch) adopted a 10-point plan to end violence and aggression, flagging actions to increase security, implementing proactive measures to identify and address risk, and improving reporting culture and support mechanisms. The comprehensive strategy came on the back of legislation introducing harsher penalties for those harming healthcare workers, and a Monash University study found 70% experienced violence and aggression in the past year. A similar plan was more recently adopted in New South Wales earlier this year in direct response to increasing aggression and violence across the state’s hospitals, including the double shooting of a security guard and police officer outside Nepean Hospital in Sydney’s west in January. A roundtable in February endorsed a 12-point action plan to curb the issue, with strategies involving regular security audits of dozens of EDs, establishing a working group to recommend lines of attack and delivering an intensive training program for ED staff including nurses so that they learn to manage aggressive behaviour. The New South Wales Nurses and Midwifes’ Association (NSWNMA) has also released an app where nurses can report and log workplace violence as soon as it occurs. In NSW, a Parliamentary Inquiry is also currently being conducted into Violence Against Emergency Services Personnel, including nurses. The Committee on Law and Safety will examine the adequacy of current practices tackling violence, the benefit of training and public awareness campaigns, and whether current sentencing options for people who commit assaults remain effective. South Australia is another state taking a stand. South Australia’s historic shortcoming in tackling the issue are improving gradually. Changes to legislation in recent years ensuring successful prosecutions result in more serious penalties have been welcomed, albeit countered by a perceived reluctance to prosecute people engaging in violent acts. Similarly, while South Australia Health has encouragingly released a Challenging Behaviours Policy aimed at minimising potential harm to healthcare workers, a lack of true implementation lingers. “We have been both welcoming of that but also somewhat critical because we want to see not just the creation of these policies but implementation of it and real results, not just platitudes of the fact you’ve done this,” Ms Dabars says. According to Ms Dabars real progress has included support in exploring the establishment of designated detox areas for patients who are drunk or under the influence of drugs. A public awareness campaign is in the pipeline to educate to community that violence and aggression towards healthcare workers should not be tolerated. The ANMF (SA Branch) is also working with SA Health to try and pinpoint statistics surrounding aggressive and violent acts in order to properly gauge the success of strategies released a year ago. “I believe at the moment that the success or otherwise of that strategy can only be called patchy. The statistics so far show there has been some decrease in violent and aggressive acts in some areas but increases elsewhere. So there is a significant amount of works that needs to occur,” Ms Dabars says. A key area of ongoing debate within the issue surrounds the potential for a mental health condition contributing to a patient’s actions and blurring the law when offenders are prosecuted, says Ms Dabars. Ms Dabars stresses that being drunk or drug affected is no ground for a defence and that it is also inappropriate to use a mental health condition as an excuse on all occasions. “I think we need to move beyond that and say well at the end of the day the person has committed a violent and aggressive act. “Right now, tonight, there’s probably over a hundred remote area nurses (RANs) out there by themselves, alone and vulnerable, and a lot more scared than they were since Gayle [Woodford’s] death,” Remote Area Nurse (RAN) Kate Chapman says. Ms Woodford, a remote area nurse from South Australia, was tragically murdered in late March, with her death sparking national interest and renewed calls to tackle enduring safety challenges facing the rural and remote health workforce. In May, Kate accompanied ANMF’s Assistant Federal Secretary Annie Butler and Senior Federal Professional Officer Julianne Bryce in visiting Rural Health Minister Fiona Nash to outline challenges and canvass strategies moving forward. Undoubtedly, aggression and violence can occur in any health setting, with the total and remote sector perhaps the most vulnerable due to isolation. Kate says she believes the voices of RANs are being heard, and with the backing of the ANMF, the workforce feels reassured that progress is slowly unfolding. At a recent meeting of the ANMF federal Executive in May, the ANMF acknowledged the alarming issue of occupational violence and aggression and demanded it be allocated national importance. The ANMF believes the issue should be placed on the agenda of the Council of Australia Governments (COAG), so that health ministers, in consultation with key stakeholders, can develop and implement a national strategy in response to the growing problem. Ultimately, it is clear that aggression and violence should not be tolerated in our health system. To combat the problem, health services must ensure safe working environments for staff and governments must inject funding to educate the public through comprehensive awareness campaigns. The prevailing culture of violence and aggression in health settings is no longer acceptable and change is critical.